It has been a while since my last post on books worth reading. I have been working hard on myself, on what I want to do and how I want to do it. This book is one that has been in my mind often over the last few months as I have gone through this process; as I have considered the goals I want to achieve personally, in work, and in life. That is why I say this book is one worth reading. 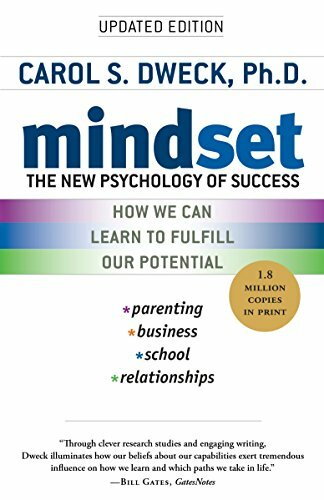 Carol Dweck's book, Mindset (affiliate link from Amazon below), is one that if you spend the time with it, it will really raise questions on how you think about yourself, your job, your relationships, your life. There are two main mindsets we function with - the fixed mindset and the growth mindset. The fixed mindset is the one in which we feel our intelligence or ability is what it is, therefore cannot be improved. Within this mindset, we fear failure as though it is something that highlights where that boundary lies. Thus, we do not take the risks, we avoid the failure, we do not reach our maximal potential. Such a mindset may be the one we created for ourselves, or it may be the one thrust upon us. Examples of this idea I have heard or seen recently in my life: I am not very creative. Girls are not as good at math and science. I cannot run a marathon. I am too old to do that, learn that, start that. As you read those statements, can you see how we can believe some of these to be true? Yet, are they? Are they really facts? No. They are simply thoughts we have that we interpret as facts. Once interpreted as a fact, we embrace it as such. We stop challenging it. We do not try because we assume we will fail. With a growth mindset, these statements may still cross our minds, but we realize that they are simply negative thoughts about the possibilities & potential. Take creativity as an example. In the past, I may have considered myself to not be creative because I defined creativity as the ability to draw. I am terrible at drawing - my pictures truly approach those of my soon-to-be 2nd grader. But, does that mean I am not creative? No. Creativity extends beyond the definition I pushed beyond myself. I write, that is creative. I find creativity in planning home decor, in cooking, in fashion and style, even in medicine. Creativity is finding originality and new ideas, art is only part of the definition. But, even further, do I really believe I am so bad at drawing there is no hope I could ever improve? I could practice, every day, and I am sure I would improve. I could read about skills to employ in my drawing and practice those. I could take a class. I have no doubt, that if I truly wanted to, I could improve my drawing skills. I have potential. I may have some terrible drawings along the way - my flowers may look like a scarecrow or my vase like a deformed blob of melted plastic, but I would learn from each attempt and I would still improve. I would fail forward. I wouldn't fear bad drawings, I would take the risk of putting pencil to paper and go for it. That is where the growth is. The idea that we have so much potential to improve, to do new things, gain new skills, and do it fearlessly with grace for ourselves because we know it will take practice. It will take work, but it will happen. Do you find yourself believing people are just born with talent? Do you fear giving 100% effort toward a goal because you see it as an all or nothing, a success or failure, with no inbetween to learn? Do you trust what others say about your skills as though it is fact? Or do you find the thrill in learning, in getting better? Do you see the potential to grow? To do something that perhaps today you do not have the skills to do? What mindset do you have? Where is your mindset fixed? Where do you have a growth mindset? Can you evolve towards more of a growth mindset in all areas? Read the full book to learn more and for the exercises and questions to really help gain insight and actionable activities to address your mindset. Thoughts are what drive your end results; know your thoughts AND make sure they are aligned with your goals.